I, like any sane, rational human being, welcome the presence of Paul Wesley’s face, and because of this, I have made a home in my heart and in our recap for Silas. But I have to be honest with you — I was not all that sorry to see him go last night. And I was not all that sorry he took the third Nina Dobrev with him. The doppelgänger stuff is fun, but there are only 47 minutes in a television hour, and I just need more of them to be spent on Caroline. “Death and the Maiden” was a TVD roller coaster at its finest. We said good-bye to Amara, Silas, and Tessa, and we moved on to a plot that I’m looking forward to exploring: Stefan has PTSD, and he has it bad. It isn’t just that he died, on repeat, for three months. It’s that the two people he loves the most in the world didn’t save him (because they were doing it). Silas was alive. I figured it was him in the opening scene, but it was hard to tell until he started talking about psycho witches … Stefan is dealing with very similar problems. “I’m in Philly? Ugh. That’s even worse.” Plus 7. Stefan, man. Minus 30 points for those nightmares. And for Elena just strolling into his goddamn BEDROOM after waking up with this brother. I cannot with her. “I miss you. I feel like when you lost your memories, I lost a friend.” This is not about you, Elena. Now get the hell out. “It wasn’t exactly a gift.” Yeah. Things were getting weird. Minus 10. Stefan and Damon watching Amara was hilarious. Stefan was all “her face again? Can’t we get a blonde up in here?” (We can. We will). Plus 7. “You know me. Probably better than anyone else.” Plus 7 for Stefan but man, Elena. That was kind of an f’ed up thing to say in front of your boyfriend. “They pushed me to hang on when all I wanted to do was give up … but eventually the pain, it took those moments away from me too.” This scene with Elena was really heartbreaking. Stefan confessed how painful the summer was and how much he needs Silas dead. And I totally heard him on that! You can do whatever you want with your doppelgängers, Elena. Let Stefan kill his. (JK, you cannot do anything with Katherine.) Minus 20. “Why can’t you just let it go?” —Silas. Freals, vamps. Freals. Plus 12. “Yeah, well get in line.” —Silas. I’ll admit that Stefan should not be getting Silas points, but I just really enjoyed watching Paul Wesley’s face say that. Plus 15. No points, but I continually find it hilarious that everyone has Silas’s number. 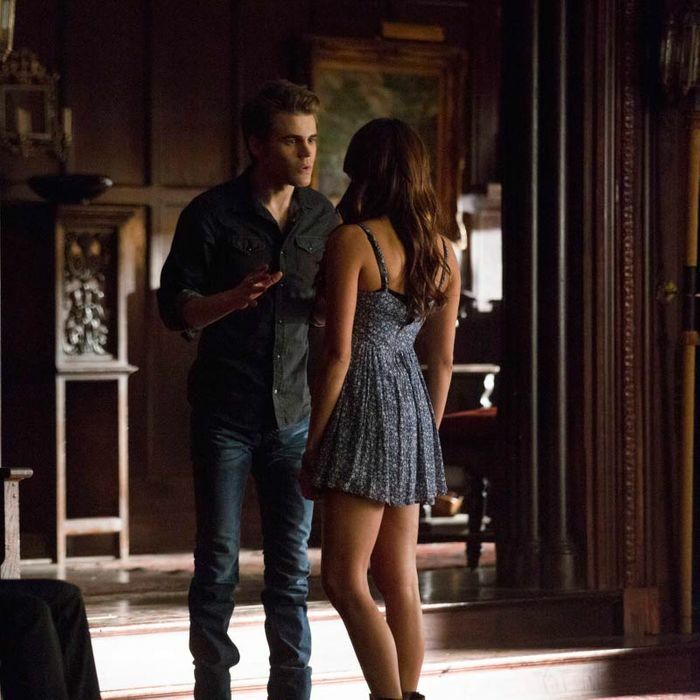 Watching Amara beg Silas to kill her was like watching Elena break up with Stefan in season two. Remember “I’ve been so selfish because I love you so much. And I know how much you love me”? So (tragically) in love. Plus 20! “The safe was the easy part, wasn’t it? Being forgotten about — that’s the real torture.” Minus 15 for Stefan. Because true. “I wanted it to be you. When that safe finally opened and somebody found me, I wanted it to be you. I wanted it to be both of you.” Knife in heart. I loved that initially it sounded like Stefan was talking about Elena in the “love of my life” context, but really he just meant he wanted the two of them to find and rescue him. Deep. Plus 30. Um, yeah. Things are not looking up for Stefan. Kinda worried about this dude. No points, but yikes. Hang in there, buddy. Damon bought Stefan his motorcycle. Do you think he was trying to subtly sabotage him with this move? Sometimes Stefan looks pretty stupid on that thing. But then again, other times he looks really hot. Let’s talk more about what Damon’s specific motivations were for buying Stefan his motorcycle. Does someone want to make a flowchart? Plus 20. Damon’s concern when Stefan broke that glass was palpable. Brother love at its best. Plus 12. I also liked Damon quizzing Stefan on his history. These two. “Let’s hope love is blind. Or at least deaf.” Ha! Neither one of them seemed remotely into Amara … so, maybe it’s true? By the way, can we talk about this, show? Is it time yet? Plus 8. But more if we really go there. Ian looked pretty cute last night. I think he got a haircut? Plus 4. “You remember Amara, right? Brunette, brown eyes, I’m surprisingly not in love with her.” Damon was great in this scene with Tessa. Just the right amount of snark. You could tell he was doing everything in his power to help this plot blow over. Plus 9. “So you live in this giant mansion with two doppelgängers who are destined to end up together. I swear there’s a sitcom in there somewhere.” —Tessa. After five seasons, that’s what happens, right? Re: Gossip Girl. Plus 8. I bet Ian could do comedy. Damon holding Amara in his arms as she died was such a tragic moment. Forget the fact that this woman looks like his love, he was losing the opportunity to give Bonnie back to Elena. Minus 10. Bonnie and Jeremy … look, I’m sure this was sweet, but I am just so over the mistreatment of Bonnie. And I don’t even LIKE Bonnie. Minus 20. “Patient is irritable. Not sure if this is a symptom, or, personality” —Dr. Professor. Katherine with wrinkles. Just take a moment. Plus 15. Nadia told Caroline that Jesse was “just not that into her.” I appreciated her attempt at pop culture, but it was misdirected. Everyone is into Caroline. Minus 10. “She’s my stylist. She does my hair.” Now that Katherine is human, she probably does actually need help with that mane. Plus 10. This Amara stuff was CRAY. But I liked her. I think. She reminded me of season-one Elena who was not, you know, the worst. Plus 8. “They made PHYSICAL CONTACT.” Ha, Jeremy. So excited to make the hell out. Plus 8. “The cute one’s here.” —Katherine. True, true. Plus 15. Nina. Fing. Dobrev. That scene. Three of her. I seriously do not know how she does it. Plus 50. I mean, wow. I especially liked when Katherine and Elena threw each other shade. I love when these two throw each other shade. Why am I saying “throw each other shade”? Okay, Bonnie coming back was emotional (in a good way). It was weird that Caroline freaked out about the extra bed in their dorm, but, whatever, she’s been sleeping in a goddamn camp bunk alone, so I get the excitement. Ghosts are real. Plus 15. “I missed this. Holding your hand.” Right, Jer. That is totally what you missed. Wait, I forget — have these two ever slept together? Who cares? Plus 10. Tessa killed herself! Could we be so lucky? Tessa, Amara, and Silas all gone in one clean mass suicide? Plus 40! This show knows when it’s time to move on. Didn’t think things could get worse for Bonnie, but they did. Minus 20. “I don’t want to know you.” Katherine’s dismissal of Nadia was brutal, but I got why she was doing it — she was sparing her daughter additional pain. Have I mentioned how complicated and incredible Katherine is? Katherine for-ever. Plus 20.